Author(s): Ilona J. Kosten, Thomas Rustemeyer. Department of Dermatology, VU university medical centre, De Boelelaan 1118, 1081 HZ Amsterdam, the Netherlands. The idea of regulatory T cells (Tregs) lost its popularity during the 1980s and 1990s, since immunologists failed to elucidate how the innate regulation of immunological reactions worked. The entire re-evaluation of the Tregs was supported due to the increasingly influential and state of the art immunological techniques, as cell sorting and also the expanding understanding of the immune system and its functions which aided in attaining a greater insight into the mechanisms of regulation and suppression. Many researchers nowadays have demonstrated that Tregs may well have therapeutic possibilities for the treatment of autoimmune diseases if it was a possibility to isolate and infuse these Tregs into patients, preferably without any harmful side effects. Therefore, modulation of Tregs as well as their generation is being researched since they were proposed as therapeutic interventions in several disease sceneries, nonetheless, sometimes with disastrous consequences. Consequently, a full and complete understanding of the exceptional biology of human Tregs is fundamental for the accurate interpretation of found data, before therapeutic interventions can be undertaken. This literature study gives an overview of the current accessible information on the topic of the characterization, the generation, regulation and functions of the Inducible Treg populations and their subsets in the human immune system. Keywords: Characterization, regulatory T cells, tolerance, Tr1, Th3, TGF-β. Affiliation:Department of Dermatology, VU university medical centre, De Boelelaan 1118, 1081 HZ Amsterdam, the Netherlands. Keywords:Characterization, regulatory T cells, tolerance, Tr1, Th3, TGF-β. Abstract:The idea of regulatory T cells (Tregs) lost its popularity during the 1980s and 1990s, since immunologists failed to elucidate how the innate regulation of immunological reactions worked. The entire re-evaluation of the Tregs was supported due to the increasingly influential and state of the art immunological techniques, as cell sorting and also the expanding understanding of the immune system and its functions which aided in attaining a greater insight into the mechanisms of regulation and suppression. Many researchers nowadays have demonstrated that Tregs may well have therapeutic possibilities for the treatment of autoimmune diseases if it was a possibility to isolate and infuse these Tregs into patients, preferably without any harmful side effects. Therefore, modulation of Tregs as well as their generation is being researched since they were proposed as therapeutic interventions in several disease sceneries, nonetheless, sometimes with disastrous consequences. Consequently, a full and complete understanding of the exceptional biology of human Tregs is fundamental for the accurate interpretation of found data, before therapeutic interventions can be undertaken. 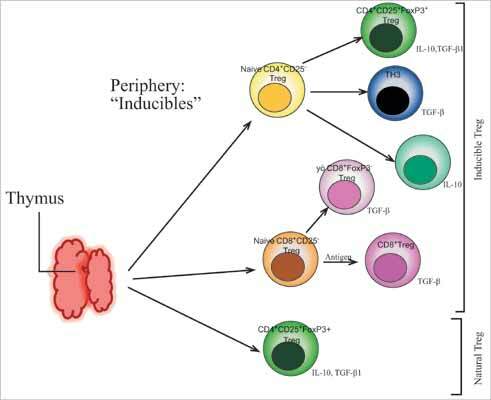 This literature study gives an overview of the current accessible information on the topic of the characterization, the generation, regulation and functions of the Inducible Treg populations and their subsets in the human immune system.